Working under the protection of the King of Belgium and the Ministry of the Fédération Wallonie-Bruxelles, the Royal Academy of Belgium is one of the oldest institutions in the country. 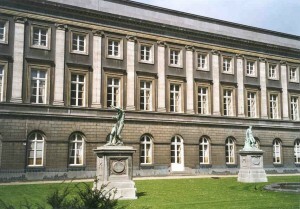 With more than 350 members, in Belgium and abroad, divided in four Classes (Science, Letters, Humanities and Social Sciences, Arts and Technology & Society), the main mission of the Academy is to promote scientific and artistic research and to encourage initiatives in these matters, by its material and moral support. The Academy is a center of cooperation between Belgians, but also foreigners, scientists and artists. The Academy publishes the work of its members of deserving researchers. The Academy also awards grants and prizes to the winners of organized competitions. In 2009, the Royal Academy of Belgium established the Collège Belgique. Sponsored by the prestigious Collège de France, the Collège Belgique offers to everyone – curious, novice or researcher – an access to research, be it scientific, philosophical, artistic, political or historical …. Making the connection between society and research is the aim. The Royal Academy of Belgium is also a publishing house that launched new collections in September 2012, in particular L’Académie en poche (Pocket books Academy). All its books are available in printed version but also in digital version(eBooks). The Academy for Dutch Language and Literature (KANTL = Koninklijke Academie voor Nederlandse Taal- en Letterkunde) was founded in 1886. It is an independent cultural and scientific institution cooperating with universities and other institutions involved in culture policy. The literary and linguistic research it focuses on, is complementary to the research performed at Flemish universities. Through its own research centre CTB (Centrum voor Teksteditie en Bronnenstudie, i.e. Centre for Scholarly Editing and Document Studies), it presents itself as an actor in the field of Digital Humanities. The main focus of the Academy is the academic study, preservation, and promotion of Dutch literary and linguistic heritage. It creates national and international networks within the academic and cultural world to stimulate collaboration and discussion. It disseminates research results by organizing academic conferences and introduces literary and linguistic topics to a broader audience by organizing cultural activities, book presentations etc. Moreover, the Academy advises the government about certain topics concerning Dutch language and literature. Click here to learn more about the Royal Flemish Academy of Belgium for Science and the Arts.